With more than 15 years in the cannabis space, Brandon Gold is an experienced founder with a demonstrated history of working in the alternative medicine industry. 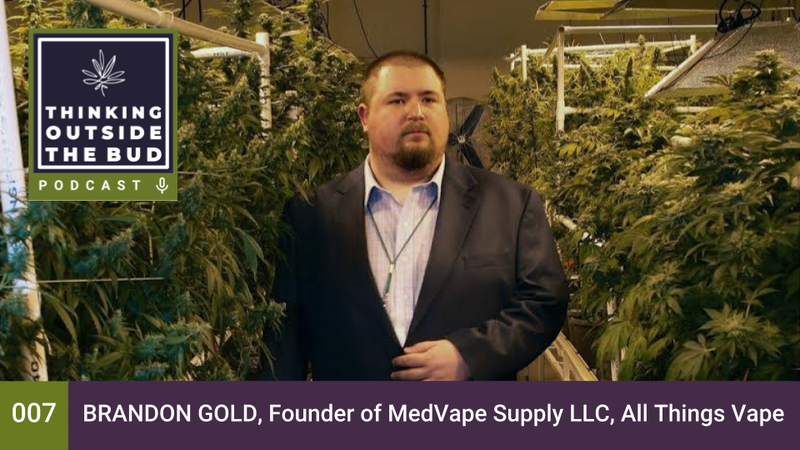 He's the former Director of Cultivation at Garden State Dispensary, Former COO of Curaleaf CT, Currently the CEO of Gold Syndicate, B16 Manufacturing, Medvape Supply LLC and All Things Vape which specializes in the latest vaporization technology. With a successful background in management operations, he’s focused on capturing a significant share of the impending exponential growth in cannabis-related markets and understanding the business side in terms of investment and bringing in funds management and governance. [00:00:31] Welcome everyone. We are here on the next episode of The Thinking Outside the bud today. I've got Brandon Gold with me. Brandon welcome to the show. Thanks for being here. [00:00:41] Thanks it's my pleasure to be here. [00:00:43] And I'm going to put your full bio in the show notes here because it's pretty extensive but just you've been in this for looks like almost 15 years maybe over 15 years now in about 17 years 17 years. [00:00:55] I'm 33 years old. So it gives you kind of like an idea. Been doing this since Iowa. I don't know. I've been doing this since I was 18 years old in very small capacity obviously nothing crazy just goes between work and you really do. Yeah. [00:01:09] And so when you've been director you've been Cultivation at Garden State, CEO Cheryl eesh Seob danc research and development. Currently your med vape supply LLC all things vape,gold syndicate and B16 manufacturing so it's quite an impressive list and I think what is exciting for me in terms of having this conversation is really an understanding that those two areas kind of management operations grows themselves like what goes into the complexity into making sure that you've got a successful grower and productive grow at scale and then understanding the business side in terms of investment and bringing in funds management and governance. [00:01:51] So I think what we've got to talk about both of those things but you know I think it's a really interesting conversation that to see how those things intersect and affect each other. So why don't we start with just the big growth side. [00:02:02] So I mean I think a lot of people have heard about Bros. And you know what goes into bro. [00:02:08] But I mean when we talk about gross today where are we in terms of technology scale size like what goes into a sophisticated grow at this point. [00:02:17] It's a multifaceted question. What you have right now is you know my family is very heavily involved in finance right. So so you get Alais funding when I first started growing kind of everybody laughed at me and said What are you doing. Get your head on straight. You know you need a real job get it together. And I said you know I really like you know I'm so at that point I was 18 or 19 years old and I'm grown cannabis legally in California. But you know we were growing you know in my in a second in a two two bedroom apartment and one of the apartments and sort of grow slopping up a compliance sticker that says that we're growing and I'm a patient. And then you kind of had this weird gray area where there were broker dealers and dealing with dispensaries and the idea and then there was Prop 215 and SB 420 that came out in California which allowed you to be a part of a collective and then grow for that collective. [00:03:11] So it was kind of the Wild West in the beginning and we kind of took advantage of it. But it's cannabis. And in California is to California is 10 years ahead of California Oregon Washington and Denver kind of ten years ahead. [00:03:27] Now on the East Coast where where my main bases of operation are because I think the East Coast is the next place the pop up. So I first started it was there up some lights you know get some good nutrients and make sure things are good and the plants will be fine. And that's on a smaller scale. And quickly people start to see some of the things that I was doing and wanted some stuff implemented into their larger scale operations in the San Fernando Valley in California. [00:03:55] So I got involved with some bigger grows there just just looking at what they were doing and seeing how I could make it more efficient or better. You know at that time the earliest 2000s and you know people could still use Eagle 20 and there was no. The sites are pesticide requirements. There was no testing requirements and I mean you know I think that the industry's come a long way because now that they require all the things that makes us safer product for the end user. Now it starts to grow inside larger scale grow operations. You know I've done over. I don't even know what the last count was. I think is 115 or 116. Large scale grows that means the lights are more like 10000 square feet about we started getting into extractions volatile extractions somnolence extractions and these Ozier compliant extraction facilities as well. [00:04:49] And I had a really you know learn by the seat of my pants and speak with some of the people I know are now part of my chemistry section. And you know construction sites and things like that in my new business which is GoBes and the kids and the 60 minute fraction. [00:05:03] So large scale operation compared to a small scale operation is like you know it's like building a robot can play or playing with like something you bought that you know best buy you a little you know robot or whatever it is. It's worlds differently. It's the difference between growing tomatoes and your gardening and Mager commercial agriculture. You know for large scale production. [00:05:28] I mean in terms of the sources of knowledge I mean how much did you kind of learn or borrow or game from from agriculture production versus some of these other industry I mean we're we're we are so short of knowledge of what contributed to kind of the size of the bill and I'm only one of the results of it. [00:05:46] Yeah. They pressured me to get you know some of the operations I was pressured me to get order cultural license not a license but like a certificate. [00:05:56] And that's what they do with a lot of their growers. But essentially what happens is is it's like we're at the point of prohibition with alcohol right before alcohol and I hate to use that reference because I think cannabis is a medicine modern lexicon. But it's similar so you have you know these people kind of know what they're doing. You know you have you have people that are great amazing wrote talent. You have great amazing extraction talent and and then you have you know all this money going into a license in a facility and all these different things especially here on the East Coast. You know and then it becomes a business and it becomes you know you got to have you know your standard operating procedures you have to have your integrated pest management or PMS as the industry calls them in place you're reporting to you know let's see like in Jersey it's the Department of Health in Connecticut it's Department of Consumer Protection. Now they are you some are more like your your friends and they believe in the answer and some of them are more like cops and they really don't believe in it. And you give an example when we were in Jersey our point of contact that DLH is an X state police trooper who absolutely did not believe in cannabis and his goal was get as many citations as he possibly could in his own brand of rogue cop mentality when we were bringing in all of this tax money and we're doing all of this good for people. I mean when I was out in California I really thought medical cannabis was a way for people to get their medical care and kind of this garden consume cannabis legally because they like it. And that's in my opinion that's all about excuse you need to use cannabis. [00:07:37] Now I think probably mobilize in a certain way and those all these different things but permits real myself again as cannabis ops. [00:07:46] You know you have to really really really have of the boots on the ground that understands two things which is what I do and where I would where I was initially. If somebody knows how these cannabis operations run and how they're supposed they are on. And you should be able to tour a room and see if there's any sort of infection or there's any sort of cereals or there's any sort of anything that's wrong. Down to you know if there's a nitrogen deficiency or if there's a calcium decision that you need you need to have somebody at the board level that understands that and has 10 years behind them inversely you have to have somebody that can communicate with a board cut throat private equity people. Yes. It's kind of like there's only a couple of us in the country that can do that level of you know wearing two hats I guess you could say. But the problems lie how companies are structured. [00:08:43] Yeah that's the biggest problem right now defined. [00:08:46] I mean I I'm curious if this is when this becomes a problem. Is it in this setup is it in the management or is it in the kind of the crisis like when things when things are not going as planned like how do you resolve all of those all involved. I mean as said we you know in tech I come out of the tech space and there is there's there's always been kind of a similar thing which is a little bit of a translator or a person that can understand the intricacies of the software and the systems and the integration that needs to happen and the business folks are the kind of executive folks in terms of you know trying to achieve some kind of business strategy business goal. And oftentimes what we found is when things aren't going right it's because the executive side is sort of muddling in the technical side trying to actually manage the task. And that's often when things go wrong it sounds like kind of a similar. [00:11:21] Know might read something along the lines of you know how will new CO new Cameco x deal with an outbreak of powdery mildew in its grow and then it has an avian c section on what pesticides you're going to use the the the. [00:11:37] And it used to be a lot easier. Like if you look at Palm AG for USDA organics cannabis industry people don't have access to even that because it's been ruled out but that's not OK to use when it's fine to use. And I'm not and I'm not a proponent for pesticides when I see pesticides. I mean garlic oil and Rosemary oil. But there were some growers that I worked out where you were going to just for instance spray water on the plants if you're using it in the capacity as a pesticide pesticide. So it doesn't matter what it is if the application there tonight. Yeah they deadlocked U.N. which is not a good thing. So so so you know the biggest thing I could say regarding you know the money side of it and the ops side of it is that it's got a failure rate of something like 85 to 90 percent because you have private equity guys or hedge fund guys or people that are independently wealthy investing in these huge Canibus corporations and then they're bringing in the green guys that are that are growers that they know of or something like that but there's no there's no background or anything like that and they cut the mustard for a little bit and then when a problem happens then they all freak out and they'll go to some big conglomerate not going to name names again. [00:12:52] But there's about five or six of them in the United States they have big cannabis conglomerate and their websites are really pretty and attractive to private equity people. They're normally run by criminals at the top top and you know. But there are these big conglomerates that come in and they look at your grow and they say no. Even if it's right I've been on the finance side of things and they said oh we're having a second opinion come in alongside with you. Where I go and I'll give them my rundown on what's wrong with it or what needs to be done. They'll come in and give us a completely separate one and then they'll lock them into service contracts and that's kind of like it's kind of like you know teaching a child that they can just pay their way out of it and then the roots really happening is that companies locking them into some sort of insane contract for a service agreement and trying to get it to they come in and actually manage to grow them. [00:13:45] I mean that's that's the kind of conflict of interest is there going to come and I have no idea what they're doing. [00:13:49] I've always represented the point that always represented the idea that the person who built the grow or the person who was there for money it was a concrete slab. And you know four to four walls and a ceiling. Whoever was there during that bill that is the only one that actually really knows the intricacies of what's going on because there is a ton of science in the building of a cannabis production facility in the 90s it was very simple lights. They will some nutrients hippiedom it's done you deal with the effects of what's going on into the 2000s you're dealing with rooms that are clean with no drainage and some tables and yada out and now we're at a point in technology where you know the brooms that I build and design that I have you know ready to go essentially out for my jump team soon who know how to build them. They're hermetically sealed. I mean down to you know positive negative air pressure in the room using the CVB lighting for pest control which is totally dangerous for people to be in. So Migros or go from everything from your outdoor grow to your quite literally mechanical or or totally autonomous or full or something autonomous grows or something you want to go in once a week take care of the plants diagnose any sort of toxicities or dirt or deficiencies. If there's any or bugs which shouldn't be because it's totally hermetically sealed and then they're modular as well so if you have an infection you can dump that one room and you still haven't lost. You might get a week behind but you're not going to get three months behind you. [00:15:28] So you're actually containing containing the issues the restructure process that's 100 percent the only way to succeed is do. [00:15:36] So what you have is going back to some of the licensing procedures and the big growth coming on board is they'll make a facility look if so if they put in their application we will have a you know gain a lab grade team and chamber between the locker rooms and the grow area you know in the locker rooms are going to put on Tyvek suits they're going to go on to the growth area they're going to get they're going to get sprayed down by a mist. They're going to get the CVB or whatever it is with the suits on ice closed step into some sort of a solution like a water bath and then be able to go into the grow which you have as his companies building something that looks like that but it isn't actually that it's smoke and mirrors. And then even more so than going to the growers I mean I've got to grows that look like a multimillion dollar grow drains on the floor. So yes you making a ton of work for the growers on the ground to be able to start to empty out these tables and do these different things with nutrients when it can all be done through plumbing and autonomous you know flow systems like ebb and flow or whatever it is they make nutrient dosing systems. [00:16:44] Now they make full you know nutrition and pest management control systems now and those run in the hands of the 250000 dollar range and when you have when you're when you're speaking out of grow. What I found in the last six months is that we'll spec out it grow and we'll be contending with another grow operation or another another candidate consulting company Maestro's are going to be more expensive. I don't want to be involved with anybody that doesn't spend the money to do it right or stop. So you know I have a bunch of other businesses that I've bought on call that ancillary to cannabis manufacturing you know for the vaporization industry which I think is the best way to make cannabinoids bioavailable in all sorts of stuff. I mean like I said I think first of all we could spend you know hours talking about cannabis. [00:17:33] I'm encouraged to talk a little bit more about that. [00:17:36] Now the funding side of it so so I get that from a technical point of view we now have you know a state of the art facilities which are really sound like clean rooms for producing you know silicon chips you know where it is incredibly isolated or incredibly controlled environment you know minimal human interaction to avoid human error as possible but they're expensive. I mean we're talking serious money that needs to get put down. To be able to fund now the licensing but the construction and the management of this stuff shahadah how do you from an organisational entity finance structure actually make this stuff work. Now to pull that money together. [00:18:13] These questions are literally things that I deal with everyday so it's pretty interesting so there's three different kind of caveats where I come in so there's that grows that I've done it wrong or it cheaply in the beginning and then and they need to fix that that requires a CapEx investment. And that's not something that the board is happy to hear about. Quite literally they have to wait for their money to grow on cannabis which is not something that private equity people are used to. They're used to knowing you know exact topline metrics series the exact numbers and that don't change or change them just a varying degree whereas in rowing you know if it's summertime in Massachusetts and you don't have your rooms Perfect's you're going to see a spike or humidity spike and you're going to one person walks in with one spore on them and you can contaminate an entire so yet treated like them like a total clean room so were private equity money comes and this is where it's interesting and more so than anything. Now your question was how does it integrate with the development with the growers or how does it actually look like when it's up and running because there's two different I be interested in both guys. You know for example Atlas I don't consider myself the best in the industry. I consider myself to have one of the one of the best aesthetics in the industry. So there's people that can come in they can offer you a solution and that's going to work and you're going to make money but at some point you're going to run into a problem and they're gonna say oh it's you know climate related or it's going to be you know somebody brought in a bug and or like a spider man or something like June July August or spider mite seasons you know if you walk by a hedge outside most likely spider mites and it if you get it on your sleeve and then you go into there and like I said it's tough to get to get a facility up and running. [00:20:05] I mean it's one of the facilities that I've built as you know has essentially three traps before the growers can go into the into the grow room and that's access control. You go in you have the shower when you go in there from that shower you're going to take a towel that was Sounness sanitised by us and you know male and female shower rooms and then you're going to go to a male female like your rooms which have been sanitized and have the BBC lighting in them that's making sure that everything that's on all the walls are completely destroyed they're sanitized every three days with by the vital oxide which is a surgery grade room cleaner things like that. And this is some details with this if people are listening to this and they don't know what I'm talking about they need to go back and do recipes and only then once you're wearing our uniform that's been cleaned onsite and we know that it's clean. [00:20:58] Are you allowed anywhere near into the production side of the facility and that's for kitchen that's for extraction that's for road wherever it is and then Kabia if you're reading if you're doing genetics has to be a separate facility onsite that they're never allowed to come into the grow until they're not breeding anymore because the last thing you want is a mouse for it is you want male contaminants to be in an all female room. It looks the entire harvest so that large amounts of money side of it. So it's extremely easy to get private equity excited about large scale cannabis operations. Keeping them interested and when all the new and Jeff Sessions is releasing these these news articles that he's going to shut down cannabis facilities when he schedule CBD when would you have a lot of people with cold feet right now so they're really into what they want to be involved and we're talking when I talk to middle raises we're talking five to ten million dollars. No we're doing a raise for Massachusetts right now. It's a timely raise and we have letters of intent for six out of ten. And once we get that turn we can we can build the facility out and do what we need but then there's a staged investment after that. These are big investments that people need to understand it's not. [00:22:13] I get approached by people that say I have 250000 dollars I want to invest that cannabis and I said go find 10 hours close to their lowest investment is a million dollars like a million dollars. It's like you know we want to mitigate the amount. [00:22:29] I mean it really is really it's a real estate investment. I mean you're talking about a serious contraction and serious serious development to really get these things up and running. [00:22:38] Yes so here's where the problem happens. You get the money right so you get the 10 million. Let's see that let's say 10 million is that 10 million is one million dollars for each representative of raising that million dollars and you have ten board members or whatever it is 11 12 board members whatever it is you have them arguing about you know the growth comes in and says we have a problem with this. We need to make sure we get our dehumidifiers goes down. This is just like AAPs every day whatever demonised we have to air and you made a fire tomorrow what's on the board what's that going to cost. Well the demystifies are one of them went down it's 5000 we should get a second one in case this happens again that's 10000 in the area and overnight is another 25 hundred as they weigh about a thousand pounds. So when they're talking about a seventeen seventeen point five steps you are talking billions of dollars and 500 dollars for that for something that's needed to keep that grow. And they're debating that. Now I'm talking about the private equity people being on the board are debating whether or not that needs to happen and the growers selling them if you don't do this we're going to lose the crop and then they sit and they wait five days later. Okay let's do it. Well five days have now gone by the plants and stressed you bring in that thing you're going to have something wrong and then they're like well what happened we got you what you needed. Well it's not you didn't you didn't get it to me the next day out to me five days later plants have already suffered irreparable damage and little things like 5 per cent humidity up and down. [00:24:07] It wasn't skin problems little things like temperature up and down by five degrees can cause huge problems even if it's for a day. So and there's no shutting it down once you turn the machine on it has to go into. Yeah yeah you're on a train at that point you've got to see if you have a lot of distrust in private equity I mean I can't tell you how many private equity hedge fund groups things like that that I've dealt with that are really interested and actually get on the ground and then they did they implode themselves because they don't understand the capital investment that they need to make as the growth keeps going. So what I offer with both syndicate is a very clear picture based on the lowest numbers possible to investors and I say listen more my numbers are calculated on a worst day doomsday scenarios. So it's short of losing the entire harvest you know yields back into three pounds lighter two and a half pounds a light I cut that in half and that's my yield projection on the performance. So what you have is a lot of companies out there that are representing themselves. I just looked at a DAC from a company that's bloating them by like 300 percent bloating all their returns and then they're not taking into account what's going to extraction because the big business these days extractions extractions entered the market nationally is still about 40 percent lower but it's surpassed by your pens your card your your concentrates for dabbing your years of Lingle's your topical things like that all Beenz. I only project that it's going to go. It's going to go in that direction even more so maybe five years from now it's going to be 20 percent flower 80 percent extract. [00:25:46] So what happens in the. So you said that the problem is that they haven't even accounted for the extractable. [00:25:50] Well I mean just in some cases I mean like for example like let's say a grow. Let's just use round numbers let's say a grow on Marvis that's going to do 100 pounds which is not a lot. Let's say it's strain specific and you're going to do twenty five pounds of that. So you know it's a it's a it's a girl scout cookies strain you're going to do 25 pounds that's going to be allocated for extraction Nungarin. So it's already cost live resod is the highest quality highest possible cannabinoid content and you can do your yields on that are gonna be extremely low. But what they're doing is they're Nottie or let's say it's a lot what a lot of people do is they do the trim so in states like New York where things might have changed for the last I checked they're only doing extractable as flat where they're at. What they're probably doing is distillate which is of its distillation of cannabinoids but there's a there's a loss factor so you might only get on on flour to crude oil you'll get like a 50 percent yield on that 50 percent yield you're going to yield another 30 or 40 percent if you're lucky. Got it. So it's how many times you're washing does that to get as clear as possible. [00:26:59] Now there are some companies out west that are doing six wash clear distillate so literally as clear as water and it's the most purest form of THC you could possibly get. Those are what's going in the pans that's what's going in for food. You know there's all different methods of extraction volatile meaning they're using they're using solvents like chain hexane pensée and which are scary words but if you're if you're running a proper lab all of that is purged out completely. It's used to be it's a way to extract targets and if you don't you look at any extracting extractions at Farma they're doing way crazier things that can be solved and so the states that are allowing volatile extractions are the states that are on track to doing it correct like California like Colorado. It's very important in the structure you know in states like New Jersey to get a lab up and running it has to be OCEA compliant. It's a huge capital investment in states like CTF that has to be run through no Savala and so like a water CO2 extractor which is 150 to 200 thousand dollar machine and then you can use ethanol no answer zation process and things like that. [00:28:04] We're getting a little too scientific but not a concert. The point is is that they contradict themselves or the laws contradict what is actually implemented. And that's because of a very big topic that not a lot of people know about which is the states are using your applications. So they're releasing guidance and those say these are guidances with the application process of state x ray people ban in droves apply and use best practices to which still mostly most of the time get some sort of a doctorate in horticulture or Ph.D. or whatever it is to write those and they'll win but then they're going to be held to those best practices. And that's where it becomes a big problem for production forgetting Edison to the people. I mean I can't tell you how many facilities failed microbial on point 0 0 1 when the apple that you're biting into that says USDA Organic GMO free yachtie Oddy on it. You think it's the best thing in the world you're putting into your body that went to the same standard which is a farmer's standard for the cannabis. And I wouldn't see apples anymore. Yeah. So is that whole different set of pesticides need to need to be evaluated some say it needs to be used they're using it in income again in organic Commack everything. So you can't hold a botanical product to a farm a standard from that thing and that's where a lot of states are failing and I think you're seeing a lot of the laws loosen up a little bit with private equity money the biggest problem and also on this this topic don't miss once the operation is greenlit built and ready to go. [00:29:43] There's no seat at the board for. So any and that's how it's been for the future. They're making all these business decisions that are affecting ops on the day to day ground floor and they don't know then ops doesn't know what's going on. So they're continuing they're doing the regimens they're doing what they have to do and then some suit will come in that says that their director of motivation or whatever it is and they'll say well we're going to change it up we're going to do this. Oh but we're mid row. Why would we do that may grow. Doesn't matter it's what the board wants. We're doing it and then the board yells at them when when the crop isn't isn't isn't successful so it's much more money is a double edged sword. Money and so I will not involve myself in any grow operation either consulting or actual implementation at a growth facility unless my team in extractor a grower myself and one other have board seats and we can make decisions per week and we have final veto power over everything. [00:30:42] So unless it's spending money if it's a decision on the ground floor or like what nutrient are we going to use or what CO2 level are we going to put in the rooms and all that. That's the OPs team's side and the board of directors and private equity money that isn't Bobbit that has made me read some things on YouTube or for or read some Lams articles how to top apps on how to grow. You're not a you're not accountable for your money. I know it's cool. I know it's Canibus but you cannot by any means. [00:31:13] It makes sense. I mean I think that's you know very similar to anything that's kind of heavy hot R and D research and development of things where you really need to separate out sort of the science from the management and the and those things and making sure that you've got the right people making those decisions because it isn't. And the fact is it's complicated. It takes a lot of experience it takes a lot of knowledge and understanding to be able to make those decisions and if you're if you're just a investor or member a private equity person it's going to be tough for you to really make those make as well. [00:31:43] So tell me a little bit about more about what you're doing in terms of putting together the funds that you're putting together. How are you structuring them. We're kind of coming to the end here on time. But if you know people have more questions are interested in talking more about it or getting involved how would they how would they reach you and connect with you. [00:31:58] Sure. I mean I mean obviously if you want to touch base on this there's so much that I can talk on and we barely scratched the surface but my Canibus venture is gold syndicate. And what I'm doing is at this point I am investing all of my time into developing these these new set of S.O.P these new set of RPM's where and structuring teams pretty much for teams across the country one on the east coast one in the middle and two on the west coast that can jump and go anywhere within a day or two to be able to either fix the cannabis problem or to be able to plan to implement a cannabis facility. And then what I call imbedding which is you know the team wants to have it so that the team I put in place comes online and they want to keep them as kind of like your head grow or you're out of extraction your your facilities manager things like that fine you can keep my team. But now I have points in your company. I have a seat on the board and I'm going to add any money that I bring to the. So that's the upside if bringing money and my private equity side survivors and about 50 to 75 million and in private equity money that people want to be an kind of us but they're not sure where they want to be if now's the right time. What do I get involved in and right now to be honest with Deaver's steering most of them towards ancillary to cannabis. So all these products that are coming out whether it be a nutrient company whether it be a soil company whether it be a dab rig company whether it be a vaporization company whatever it is that's ancillary to cannabis where regulations don't apply. [00:33:34] That's the key. So for now and then when states start to release guidances again like mass is a big state that's it going to go off and so is New Jersey apparently so mass is the one that I'm focused on because I like the way they are records. I mean their medicine with Erec set up. Now we're waiting on guidances to see how the wreckin facilities need to get built haven't been released yet when they get released that's when we will mobilize to do the application and get things funded and we'll be doing a vertically integrated there which is essentially a grandfathered license from somebody and we're going to partner with them and we're going to make sure we get you know a facility up and running that returns to our investors very fast. But their involvement in the ops side of the business to a minimum it's very important. Otherwise you're setting yourself up for failure because they're going to get involved. Everything's going to get that. And if you have canvassed people who are doing their job and know what they're doing which is not the case in a lot of these big bros these are basement growers that are coming into our tarmacked setting and they have known nothing about you know logging analytical data or you know back end system or things like that. It's all failure. From there you need to have educated medical can read can teams that know what they're doing otherwise don't do it so you know my teams go syndicate if you haven't heard about us. We're doing our job correct. [00:35:01] Yes. She's not going anywhere. [00:35:03] We're going for the high end which is we don't have a Web site. We don't have a link then we don't have anything. And that's because let the other people that don't know what they're doing fail and weed themselves out and when we're ready will launch our name but we have enough business. Word of mouth via Wall Street and the industry that we don't really can be ghosts we don't need to be and that's not any sort of legal reasons or anything we're operating 100 percent above the board. It's just that unless you kind of get in touch with people they can put you in touch with the right people shouldn't be in of in the first place. Yeah I think that's a. I think that's a good. It shouldn't be that kind of as in the first place right. There's the company that lets you shouldn't disturb you if you if you don't know what you're reading this is great. [00:35:49] I really appreciate the time. I appreciate the conversation. I know I like you said there's probably another another six hours of taunting to get through. Thank you. [00:35:59] You've been listening to thinking outside the bud with business coach Bruce Eckfeldt to find a full list of podcast episodes. Download the tools and worksheets and access other great content. Visit the Web site at thinking outside the Buy.com. And don't forget to sign up for the free newsletter at thinkingoutsidethebud.com forward slash newsletter.